ROME -- During this incredibly rainy autumn we were left for a time without electricity, water and, for two days, no internet. Plus a lightning bolt blew out our hot water heater, yet to be fixed. But never mind. For truffle hunters, this year's soppy ground is all to the good. Truffles, these tiny bits of aromatic delight, live underground, where the more moist the dirt, the better. The wet earth means abundance, and also lower prices than last year. The prized white truffle, which presently costs up to $400 per hectogram (3.2 ounces), costs about $100 less than in 2017. This reporter has hunted truffles in Gubbio. Some years ago we asked the Contessa who owned the truffle territory just how she would describe the scent. "Ah," she said with a soft sigh, "it is like Chanel Number 5." The truffle season begins in early autumn and continues into early spring, but is now at its peak, and truffle celebrations are taking place throughout North and even Central Italy. 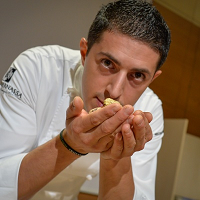 The most prized white truffle stars at the 88th edition of the annual International Truffle Fair at Alba in Piedmont, which began Oct. 6 and ends on Nov. 25 (see >>. ). Needless to say, recipes matter, and among the events at that Fair are "The Ultimate Truffle Dinners," prepared by outstanding chefs. One of these is Michelangelo Mammoliti, 30, who was born near Alba and learned to cook at famous French restaurants before returning home to Piedmont. Among the specialties of this Michelin starred chef: a truffled pecan buttermilk cake. If Alba wins the most attention, truffle fairs take place elsewhere. In the Marches in Central Italy, the Appenine town of Acqualagna, near Pesaro and Urbino, hosts its 53d annual National White Truffle Fair. This year its new Truffle Museum - Truffle Experience was inaugurated, with digital displays, documentaries and, needless to say, the possibility to taste delicacies prepared with truffle. 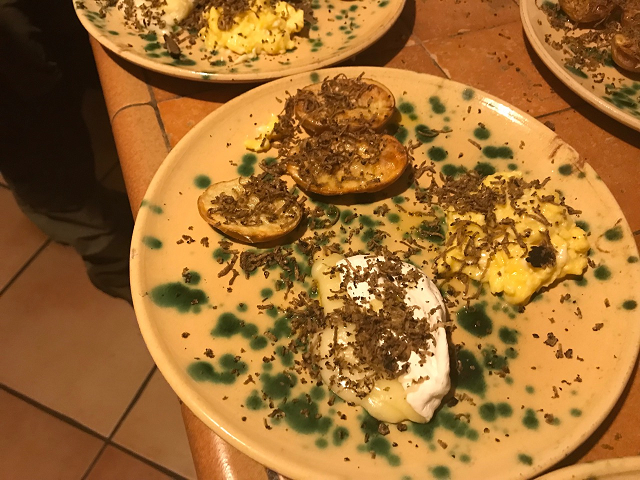 Another truffle festival, the Tartòfla, takes place near Bologna at Savigno, on weekends through Nov. 18, with market stalls, lectures in the town theater, special menus in local restaurants and tastings in the main piazza. Near Perugia at Calestano is yet another local fair, this one dedicated to the black truffles characteristic of central Italy. Here, in addition to stands and special foods, on offer on Sundays are guided visits to the places where truffles are found. Visitors are accompanied by truffle-hunters and their dogs, see >>. For truffle hunters, skillfully trained dogs, and especially (but not exclusively) hounds and English pointers, are a necessity. From puppyhood they are fed tiny bits of truffle. Later, scuttling through the woodlands of willows, poplars and linden trees, the dogs are able to smell the rich scent, even when the truffle is hidden as much as a foot underground. At sight of the canine excitement, the hunter, armed with a spade, runs to dig up the buried treasure. 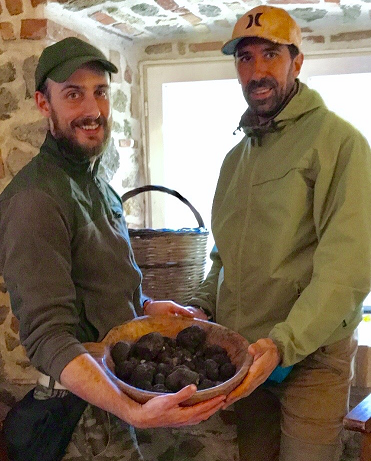 Black truffles are abundant even near Rome. Here the season is longer than in the snowy North, and black truffles are found year round save in the very hottest weeks of summer. 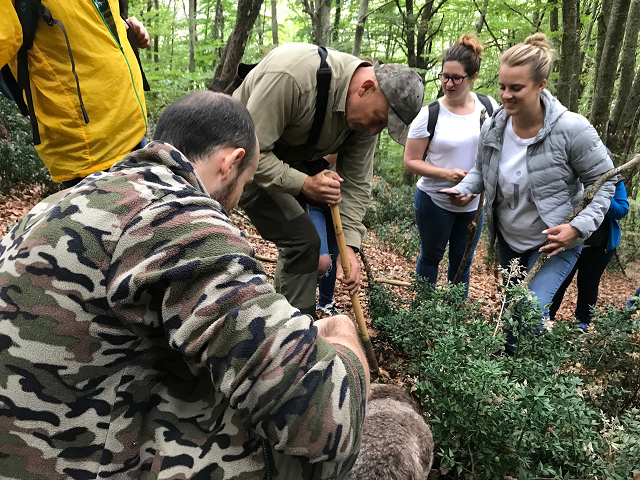 Expert truffle hunters Matteo Lavorini and Matteo Mazzarini accompany visitors from Rome -- North and South Americans, English, Australians -- in small groups on truffle-hunting expeditions with dogs (their website see: Matt&Matt Truffle Experience). Most of these visitors are from abroad, and so cannot take truffles home with them on cruise ships or airplanes, so, with the newly found truffles, a luncheon is prepared and served. One of these lunches featured no less than nine courses of dishes laced with truffles. The Matt&Matt truffle hunts take place in Northern Rome at Canale Monterano, famous for its church by Bernini and at Tolfa, a town founded by the Etruscans. 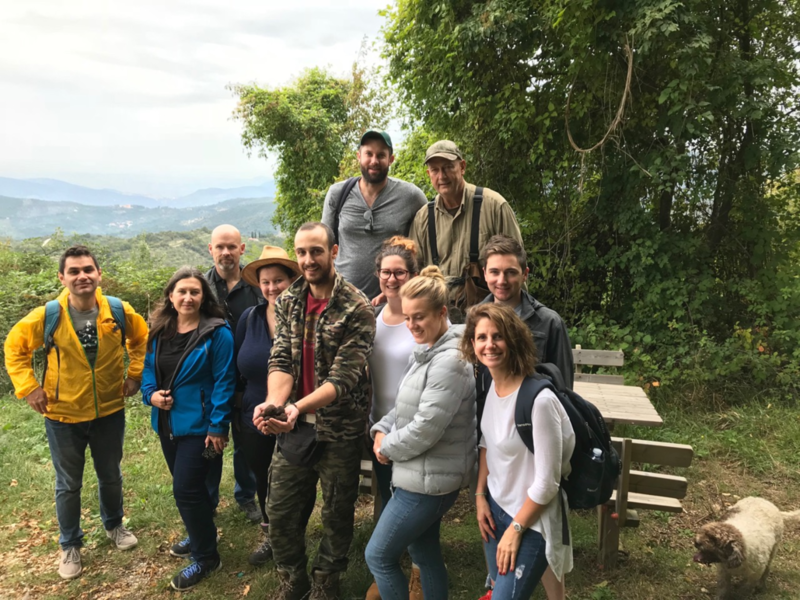 At our own Trevignano Romano (it too originally an Etruscan city) the truffle hunters climb the densely wooded Monte Rocca Romana where, incidentally, there is also a falconry park. Should you receive a truffle for Thanksgiving or Christmas, how would you serve it? Personally I prefer a pasta -- ricotta cheese-stuffed ravioli especially -- laced with cream and scattered atop with truffles in the thinnest possible scrapings. Far easier and more accessible are the potted truffle sauces now available for spreading atop chicken fillets or, for an aperitivo, on crackers or toasted bread. Buon appetito!